We report a case of a 45 year old male patient referred to dermatology outpatient department with complaints of raised skin lesions developing over his amputation stump for duration of 3 month. The patient had to undergo a below knee amputation on his left leg, following a road traffic accident 10 years ago. Since the past 9 years, he was using a plastic prosthesis with buckle and strap to enable him to perform his daily activities, with no significant complaints. On examination, multiple skin colored to erythematous papules were present, coalescing to form plaques over the amputation stump. This was associated with surrounding erythema and edema [Figure 1]. Clinical differentials of tuberculosis verrucosa cutis (TBVC), verrucous hyperplasia of amputation stump, verruca vulgaris and subcutaneous mycosis (chromoblastomycosis) were considered. The bacteriological, mycobacterial and fungal cultures were negative. In addition, polymerase chain reaction (PCR) detection for evidence of mycobacterial or human papilloma virus infection was reported to be negative. Histopathological examination (Hematoxylin and Eosin staining) of lesion showed hyperkeratosis, parakeratosis, papillomatosis and spongiosis. The underlying dermis showed a mixed inflammatory infiltrate comprising of lymphocytes, eosinophils and plasma cells. There was also evidence of neo angiogenesis and dilatation of lymphatics [Figure 2]. Special stains (Fite-Faraco and Periodic acid Schiff) did not reveal presence of any organisms. On patch testing patient did not have allergic response to any allergen. 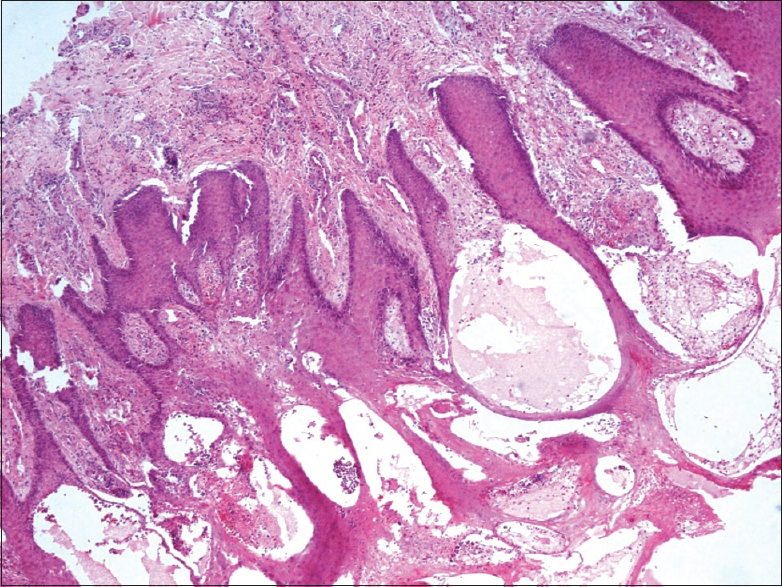 In view of these investigations, a diagnosis of verrucous hyperplasia of amputation stump was entertained. The patient was advised regular use of compression stockings along with external compression to increase lymphatic outflow from limb. He was also advised a change of prosthesis after which he reported reduction in swelling within 3 weeks and he was counseled to continue same; however patient was lost to follow up. Verrucous hyperplasia also known as papillomatosis cutis lymphostatica, lymphostatic congestion papillomatose (e.g., elephantiasis) or papillomatosis cutis verrucosa (e.g., mossy foot). presents as verrucous plaques over amputation stump usually affecting lower limb. The time of onset is quite variable as reported in literature varying from 6 months to 40 years after amputation. There have been various factors implicated in the pathogenesis of verrucous hyperplasia including poor fitting prosthesis, suction socket prosthesis, venous stasis and friction and superimposed bacterial infections. ,,, These factors lead to impaired lymphatic outflow which causes chronic lymphedema and then subsequently verrucous hyperplasia of amputation stump. Clinically verrucous hyperplasia can be mistaken for TBVC, verruca vulgaris or, verrucous carcinoma. ,, Verrucous hyperplasia of amputation stump is histopathologically characterized by pseudoepitheliomatous hyperplasia along with dilated lymphatics and capillaries with variable inflammatory infiltrate. , The absence of koilocytic changes or mitotic figures/cellular atypia or granulomatous inflammation is helpful in differentiating from other possible causes. In difficult cases, special stains and PCR can be helpful in excluding these differentials. The treatment is directed towards the possible varied etiological factors. It includes external compression bandaging, shrinker socks, pads and partial end- bearings. A short course of oral diuretics has also been used. , It should be ensured that the prosthesis should be well fitting and a regular follow up with prosthesist is essential for long term prevention of this condition. We wish to highlight an interesting and uncommon complication of amputation stump which can be mistaken for more sinister conditions. An early recognition and appropriate management can help reduce patient`s morbidity. Levy SW, Barnes GS. Verrucous hyperplasia of amputation stump. Arch Dermatol 1956;74:448-9. Niederauer HH, Schultz-Ehrenburg U, Tiedjen KU. Tumor form of lymphostatic papillomatosis of the skin. Hautarzt 1991;42:518-22. Meulenbelt HE, Geertzen JH, Dijkstra PU, Jonkman MF. Skin problems in lower limb amputees: An overview by case reports. J Eur Acad Dermatol Venereol 2007;21:147-55. Bendl BJ. Painful pigmented prosthesis pressure papules. Cutis 1976;17:954-7. Scheinfeld N, Yu T, Lee J. Verrucous hyperplasia of the great toe: A case and a review of the literature. Dermatol Surg 2004;30:215-7. Dermatol 1986;14:600-5.